Be careful while leaving your important and valuable stuff in your lockers. A 3D printed robot has arrived that can crack a combination lock in as little as 30 seconds. So, it’s time to ditch your modern combination locks and started keeping your valuable things in a good old-fashioned locker with keys. 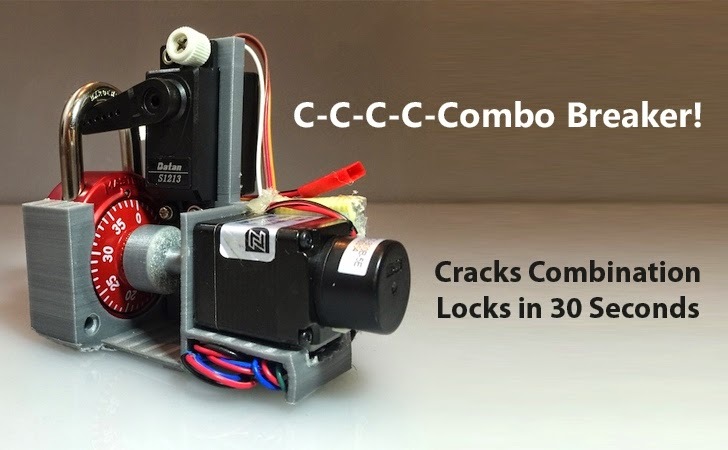 A well-known California hacker Samy Kamkar who is expert in cracking locks has built a 3D-printed machine, calling his gadget the "Combo Breaker," that can crack Master Lock combination padlocks – used on hundreds of thousands of school lockers – in less than 30 seconds. A couple of weeks ago, Kamkar introduced the world how a manufacturing flaw in Master Lock combination locks can easily reveal the full combination by carefully measuring the dial interaction with the shackle in eight or fewer attempts. However, it requires some software and things to do, and who has that much of time? So to make it simple for everyone – On Thursday, the hacker showed a wonderful DIY on how anyone can build an electronic device, Combo Breaker, which applies the technique automatically and can achieve the same result in about 30 seconds. "The machine pretty much brute forces the lock for you," says Kamkar. "You attach it, leave it, and it does its thing." Kamkar posted a step-by-step video on how to assemble the $100 worth of parts to create your own Combo Breaker. The necessary hardware includes a 3D printer to create the frame, the stepper driver and motor, Arduino Nano microprocessor, a 500mAh 3S battery, voltage regulators, an analog feedback servo and a breadboard and wires. All components are readily available online. The hacker has also released the plans, 3D models, and code of Combo Breaker online for free as open source. Kamkar is the same security researcher who developed a cheap Arduino-based Keylogger for Wireless Keyboards called KeySweeper few months ago that sniffs, decrypts, logs, and reports back all keystrokes from a Microsoft wireless keyboard.